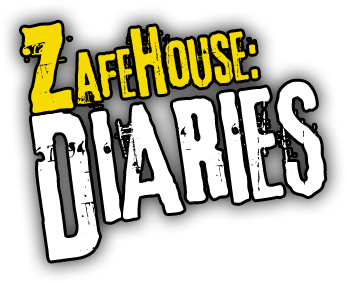 Just a quick word to say that Zafehouse Diaries is now available on Steam! If you've bought the game already, you may be entitled to a Steam key. We're waiting on Valve to send us the keys, but watch that thread for more details. Also important: buy this weekend and get 33% off! Just hit that big red button over on the top right of this page and you'll have it in no time. First time here? Find out what it's all about. And what about this Greenlight business? We still hope to get on Steam - and you can help us! If we make it onto Steam, then anyone who buys direct from us will get a Steam key too, so you've got nothing to lose. We hope you enjoy the game. Don't forget to drop by the forums and share your stories. EU customers: the price above does not include VAT. Are you sitting down? You should be because this is some heavy news. Our demo beta is finally out. Grab it here and get a taste of what the full version will deliver. We're calling it a demo beta because it's less than the full version and may still have some stability issues. Drop us a line on the forum if something's not quite right. If you get stuck, check out the manual - it's tailored for the full version, but it has everything you need to know. 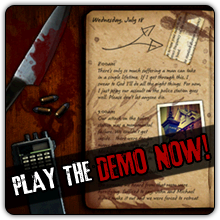 The demo also includes a diary editor. Once you finish a game, export the diary, load it into the editor and turn it into something wonderful. To read it, you can import it into the game or upload it to our online viewer so anyone with a browser can read it. We're still polishing the interface, so bear with us. We also have a teaser trailer, magically implanted below. Please send it to everyone you know. Better still, head on over to our Greenlight page and jump on that big old thumbs up button. And the full version? We're still on track for this month and we'll be making a lot noise shortly. Sign up to our newsletter or Twitter feed to hear the news. "Lana and Frank were attacked by two zombies while on patrol. Frank skewered a zombie’s head with a carving knife, killing it instantly." This simple, relatively innocuous line is typical in Zafehouse: Diaries, but it’s the result of an astonishingly complex set of interacting systems. It’s not an overstatement to say that it’s the result of months of work to get a line like that in the diary. Our key design goal with Zafehouse: Diaries is that the world - and the systems underneath - be consistent. If not, we’d have to fill the engine with too many canned events and hard-coded responses, or we’d need to go the other way and introduce too many random systems. The former would be linear, contrived and boring; the latter might be inconsistent, unpredictable, loose, and possibly hilariously so. So let’s look at that line a bit closer. Lana and Frank are survivors, each with their own skills and abilities, and they may or may not like each other. They’ve been given an order to go outside the safehouse and patrol - but not attack - zombies. These zombies are actually in the town - we’re tracking every zombie in every square metre, so Lana and Frank are patrolling around and looking for zombies in the surrounding space around the house. That they’ve been attacked shows that they’ve failed the job. This could be because it was a daylight, they were making noise, there were too many zombies outside, they were particularly terrible at patrolling, or Frank’s lingering prejudice against Lana’s homosexuality made him less cooperative. All this information is either known or can be predicted according to some kind of discernable probability. So Frank got one of them with a carving knife - a carving knife he chose based on its effectiveness at killing zombies. Given that there were only two zombies in the immediate area, he was able to get a clean strike on the zombie’s head - not arms, legs, hands, fingers or feet, which are also modeled - but if there were more zombies, or Frank didn’t have the knife, or he was injured he may have been grabbed by another zombie, become infected, torn apart, or worse. Actually, there is no worse. Lucky that carving knife was lying around at the house. What if it wasn’t there? Frank would have looked for something else. If there were no weapons, he would have looked at furniture. Maybe he could swing that lamp and use it as a weapon, or perhaps he’ll grab a stool. Desperate times. And I haven’t even talked about other events, survivors or systems. Maybe Regina was trying to create some experimental traps and one of them misfired, hit Susie, who got annoyed at Regina, then they had an argument, which escalated into Regina throwing a saucepan at Susie, which missed, smashed the window that John was trying to barricade but was going too slowly because he forgot to bring that hammer he found at the warehouse a few days ago, creating an incredible racket and attracting streams of zombies. And Lana and Frank, armed with a carving knife, would be staring down a shambling horde. We think this is the key to what makes Zafehouse: Diaries so engaging. The intertwining systems produce a lot of variety, but their internal consistency provides that strategic core. Each line you see is one of many possible expressions of the world’s state at a particular time and understanding the diary is the key to winning. Zafehouse: Diaries is Screwfly Studios' debut release, out now for PC. Tell your story: Unique diary engine records your actions, provides hints, and tracks your progress. 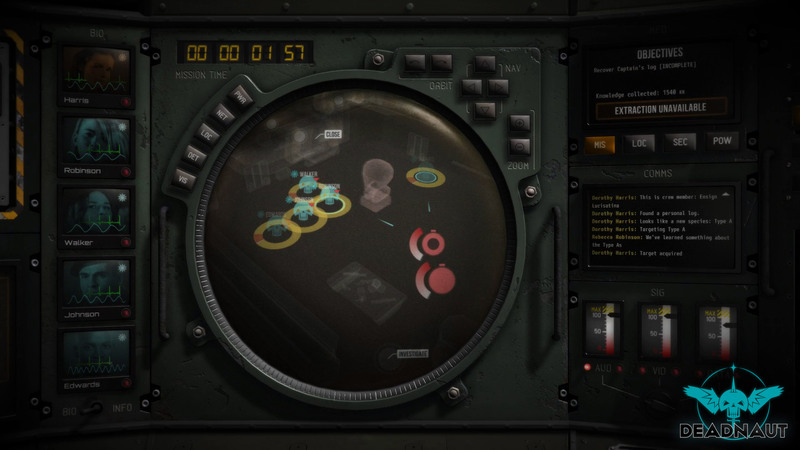 Easy to learn, hard to master: Deep, tactical gameplay sits underneath a simple interface.